Previous to a re-style this conservatory had been a misused space for years. It is often the case in smaller homes where space is premium. The room had never reached its full potential. The brief - Our clients requested a home office and wished to retain the elegance of the Victorian style conservatory and incorporate a London theme. Storage was also essential. Although the room had great potential there was limited wall space with only the outer house wall, now the office wall, available for ceiling to floor storage and desk. The other three walls as such were half glazed which gave little flexibility. Determined to fulfil the brief we gathered inspiration from the existing black and white floor tiles, and keeping it light. 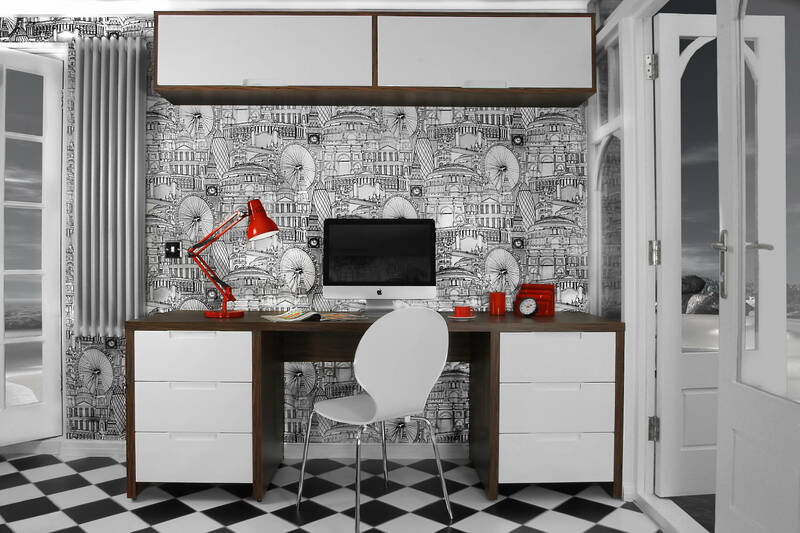 We introduced Cityscape ‘Londinium’ wallpaper from Graham & Brown to meet the London theme brief and provided ample storage. For contemporary edge – we fitted bespoke desk and storage units, above and below eye level with white high gloss draw fronts. We collaborated with Bravo London, for this installation. We suggested ‘bringing the outside in’ by installing roller blinds in a monochromatic leaf printed fabric from N V Blinds to reflect the small cottage garden at the rear, and the clients were sold. These fundamentally allowed maximum light, and added movement to the otherwise contemporary and urban feel of the bespoke furniture. Task Lighting which added pops of colour were purchased from John Lewis and accessories to match. Additional storage as neutral coloured boxes were purchased from the The Holding Company to ground the scheme . Mission accomplished. The result was stunning and refreshing.